Great idea, but shame to hear about it not being as environmentally sound as it appears. I saw an article in the Guardian saying that only clear glass is good for the environment. Apparently green and brown glass doesn’t get turned back into glass. Instead it gets crushed and is used as road aggregate… thus perpetuating climate change. j’ai vu votre collection de robe au defile de mode a San Francisco,pour l’academy of art ! simplement superbe qui est votre designer ? Sad to hear about the packaging not being recyclable in most places. We served French Rabbit at our wedding almost 2 years ago and one of the reasons was that glass is also not recyclable in our area (we live in a desert area and glass takes so much water to recycle that they just grind it up at put it in the landfill instead). 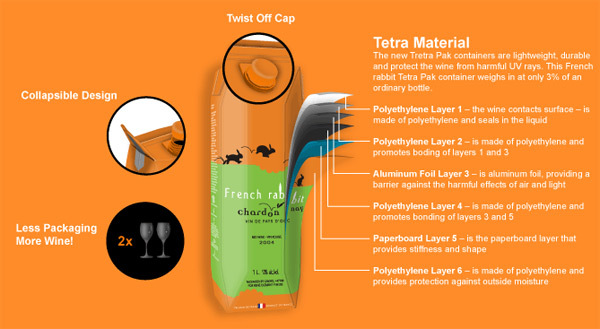 It is a good tasting wine, though, and the packaging also lends itself to be taken backpacking, camping, canoeing…. I’d be really interested to know if there is some tetra pak tech, that would be really fantastic.